HawksCode runs a high end Pay-Per-Click campaign with our resources on the move for your business and capital. We have team that manage all the activity throughout the campaign. 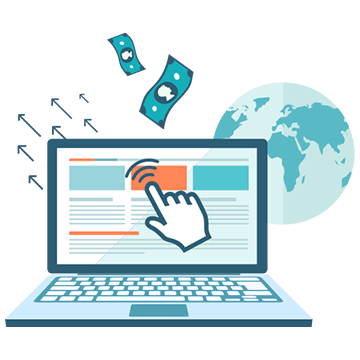 If you are looking for a PPC management company then you have just come to the right place. Making a campaign that benefits your business and you in creating more leads and customers is our specialty. With these essential ingredient HawksCode team come into play and make everything right. Knowing the ingredient is not enough. This is how we cook the marketing campaign. Advertising you one the search engine make it possible to have high conversation rate and instant traffic. Makin these paid search keep you on top of every search result related to your keyword. This planning of paid search is focused on the right keywords to give you best result. We make research on the media that can help your business and product or suits you better. Investing into right media channel makes it possible to gain positive lead on the business. This increases campaign’s visibility and ease handling contracts with conversing and focused traffic. If people can’t see how will they know about you? Displaying your service and product makes it easy to make high conversion traffic. Here we help with putting some attractive and simple ads of your service to increase your ROI. These ads are cost effective and well planned by our experts. Shopping business need more exposure and focused on right audience. As a PPC company we make sure that you shopping ads get spread out in wide and should make a big exposer. Wider the exposer more the engagement higher the revenue. They all are related to each other. When you invest in us we make sure we never get exhausted by the resources from your side. We utilize every penny of your in more optimum way. This optimized utilization keep your campaign running for little long. This way we make more profit in short term and with fix amount of resources. Social Media make big effect when it comes to influencing people into. We run social media campaign on different platform like Facebook, Twitter, LinkedIn, Pinterest and other. We also cover social bookmarking website too. These helps in making big presence of your business.